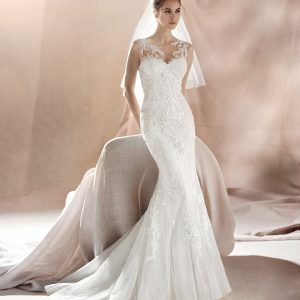 Stunning ballgown wedding dress in tulle with lace and guipure appliqués on the bodice that descend from the sweetheart neckline to the top of the very full skirt. The guipure straps join a V-shaped back with corset-style lacing. Our sample is a size 16 in ivory in lovely new condition.